I’d seen recipes for brick pressed sandwiches, but never got around to making one until we went to my cousin’s. 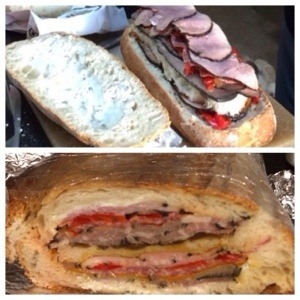 We picked up Fred Steak from Schaub’s and layered it with salami, ham, pepper relish, grilled onions and peppers, sun dried tomato pesto and goat cheese. The hardest part was waiting for it to be ready.